Ecco's NEW Life Street Booties ($180) will take your fashion game to the next level because everyone will be staring at your feet. These golf shoes sparkle beautifully in the sun. They have a glittery, metallic finish in an overall neutral shade that goes with anything. 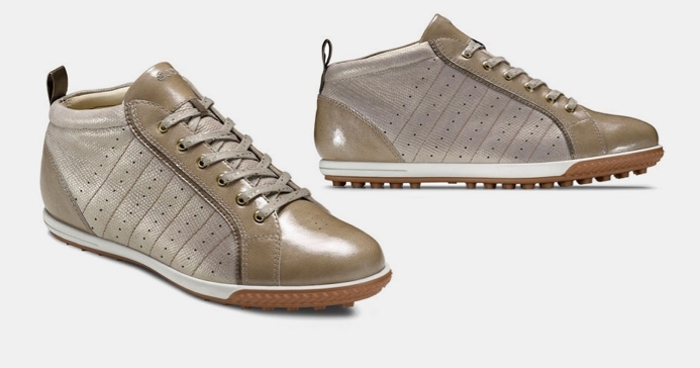 The Life Street Booties are wearable on and off the course, and could be mistaken for a luxury hi-top sneaker. They're designed with 100 TPU traction bars that are barely noticeable and they're made to hold up through rain and heat. A perfect fit for the golf fashionista who strays from the conservative. They also come in white but we're loving the gold-tan color combo best!